2012: Hunkus played 13 domestic events with four different partners, but the majority of them with Chistal Engle. The duo had a best of second. 2011: Hunkus 14 domestic events and four international events, all with Heather Lowe. The duo won an NVL tournament in Baltimore after knocking off both of the top seeds. On the FIVB Tour they lost in the country quota each time, and placed 17th in a Challenger event. 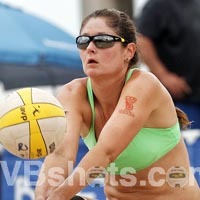 2010: Hunkus played the first two AVP events with Julie Romias, then played four tournaments with Heather Lowe. She was in the main draw for five of her six AVP tournaments, with a best of 17th three times. At the end of the year she played two FIVB events with Lowe, losing in the country quota both times. 2009: Began the year by qualifying in the season opener with Cindie Boosin. The duo advanced to five main draws in eight events, including Manhattan Beach, where they won three straight contender's bracket matches in three sets to finish 17th. Made her international debut in Finland with Brooke Sweat, as they were selected as USAV's No. 2 U-26 beach team in July. 2008: Played in five qualifiers with two different partners, advancing to the main draw in Manhattan Beach with Julie Caldwell. 2007: Made her beach volleyball debut in a qualifier in Cincinnati with Amanda Schuler. College: Hunkus graduated from Duke University in 2007 after lettering four times in volleyball under coach Jolene Nagel from the 2003-06 seasons. She was an AVCA honorable mention All-America selection and first team All-East Region selection as a senior when the Blue Devils won the ACC Championship and advanced to the second round of the NCAA Tournament after knocking off defending Final Four participant Tennessee on its home floor. She was also named to the All-ACC team twice and finished her career as the ninth player in Duke history to surpass the 1,000 mark in career kills and digs. Personal: A Volleyball Magazine Fab 50, Prep Volleyball Top 100 and Student Sports All-America honoree from Girard High School in Girard Ohio, Hunkus held the Ohio prep records for kills in a career (1,169) and season (470). She was born in Youngstown, Ohio.